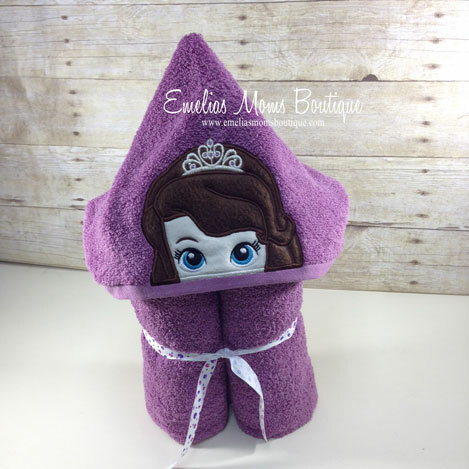 Purple Princess Sofia girls hooded towels with personalization. Our hooded towels are the perfect way to add an enjoyable time during bath time! Our hooded towels are the perfect way to add an enjoyable time during bath time! The towels are made out of a FULL sized bath towel with a hood added. These towels are Perfect for babies, toddlers, and children! They make great baby shower gifts, or a unique one of a kind birthday gift. Colors of bath towel and hood can be changed to what you would like, please email us first.